It was a slow start for the Washington Capitals' power play. Just four power play goals for 25 chances in their first six games. But as the season wore on, the Caps' special teams turned a corner and now have the hottest power play in the league in the last 10 games. That is good enough for second in the league with a power play efficiency of 28.6%. They only trail St. Louis who has a PP percentage of 30.6%. Certainly head coach Adam Oates new power play system of the 1-3-1 is paying off. In more ways than one. The last five power play goals scored for the Capitals came from five different Capitals. 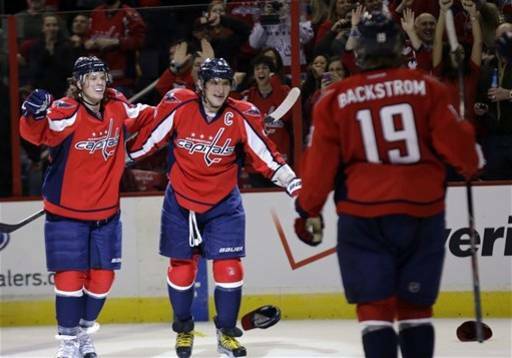 Nick Backstrom scored the latest in the big win against Carolina. Troy Brouwer and Alex Ovechkin each had a PPG in the game against the New Jersey Devils in their 5-1 win. Mike Ribeiro and Mathieu Perreault both scored on the power play first of back to back games with the Devils at the phone booth. That distribution of the wealth on the power play makes it very hard to defend. Many teams in the NHL have that go-to guy on the power play. Take the New Jersey Devils as an example. They love to set up Ilya Kovalchuk for his one timers. The Tampa Bay Lightning do the same with Steven Stamkos. But after a while, coaches have to find ways to move that player around in the power play as teams are getting better at blocking those snipers' shots. For the Capitals, dishing the puck to just about every player that is on the power play unit has made it a deadly PP to face in the league. The Caps are not relying on the Ovechkin one timer as they did so heavily under Bruce Boudreau. The spread of goals amongst players on the power play makes everyone on the ice a potential scorer. It makes the opposition have to keep track of everyone, at all times. If not, boom, the puck is in the back of their net. The Capitals ability to maintain zone time with the puck under control is another factor that helps their power play become potent. By keeping the puck in the zone and keeping it moving around with crisp passes tires the oppositions' penalty killers. It also wears down the goaltender. Ovechkin scored his hat trick goal when the Caps were able to keep the Devils penalty killers in their zone for some time. When the puck did leave the zone, Ovi quickly skated it back in and it left one tired Anton Volchenkov on the ice who wasn't able to make the quick change on the fly. The worn out defenseman for the Devils could only camp out in front of the net. The Caps exploited it not once but twice in the following sequences. The first chance brushed off the oust side of the net, while the second one found its mark. The more the players work up their chemistry with one another and are more familiar with the system, the more dangerous of a power play it becomes. With a producing power play, things can open up for the Caps five on five. At even strength, teams will be less likely to play a tight checking game giving the Caps more room on the ice.